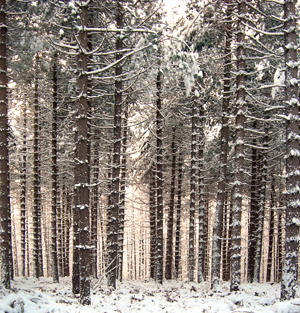 You are here: Home > Blog > A Guide to Tree Identification > Corsican Pine or Black Pine. Corsican Pine (or Pinus nigra) as the name suggests, is a plant from the mediterranean region. It is found in Spain, along to the Anatolian peninsula, to Cyprus and Corsica, and parts of North Africa. It can form part of the glory of sclerophyllous woodland and scrub. It is found at sea level to elevations of 2000 metres. 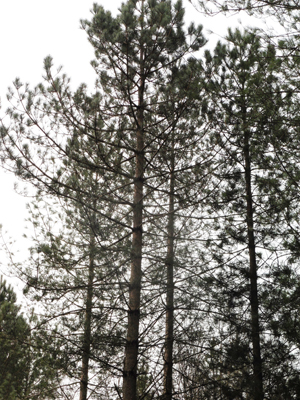 Corsican Pine is a large, evergreen tree that can grow to a height of 60 metres - though 40 metres is perhaps more typical. It grows quite fast - at a rate of 30 to 70 cm per year and is generally quite long lived (some may reach an age of 500 years), though on commercial plantations their 'life span' is considerably less. Corsican Pine grows best in full sun and on well drained soil. The leaves of Corsican Pine occur in bundles of two (see adjacent image). Various species of pine are grown in the U.K. and the leaves occur in groups / bundles of two, five or eight leaves. 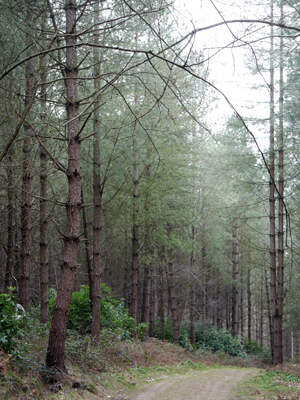 'Two - needle pines' include the Scots Pine, the Lodgepole Pine and the Corsican Pine. The leaves are quite long (12 cm or more), sometimes a bit 'twisted', green to grey green and striations are visible on close inspection. The female flowers are red, and the male flowers yellow (sorry, no image as yet). The young seed cones that form from the female flowers are a dull pink colour. 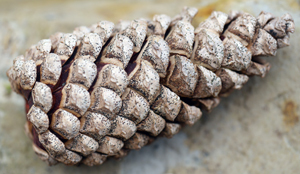 As the cones mature, they become quite woody and are a grey / brown colour. The cones on average are some 7 to 8 cm in lin length. 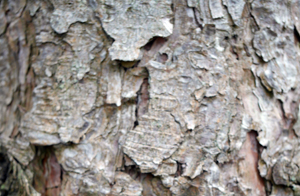 The mature bark is very flaky in appearance. There are deep cracks or fissures so that the bark of the Corsican pine has many 'scaly plates'. At maturity, it is a dark silver / grey colour. The stem or trunk of the tree is generally quite straight and 'clean', with only a few branches at a low level (certainly in plantations). Even towards the crown of the tree, the foliage is not dense and the branches there are well spaced. The crown is relatively open (compared to many trees). Corsican pine is a conifer and, therefore, evergreen. In the U.K., the Corsican Pine has been much used in plantations as a timber tree by the Forestry Commission and other bodies. The wood obtained from the tree is moderately hard and straight grained, and is used in construction, paper manufacture and for fuel. 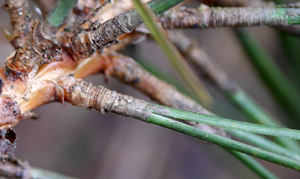 In some parts of the world (New Zealand), Pinus nigra it is considered an 'invasive species' as it may cause habitat conversion - so that native bunch grasses in tussock grassland communities are shaded out and a forest canopy develops.